I still wish they were $19.99, no glass enclosure, and put the quote on the bottom. I like the internal sculpt, I just don't like hinged glass ornaments. But, if I truly love a sculpt or they have characters I don't have, I'll cave. In the meantime, you can get all of the remaining Sketchbook ornaments (including the limited edition ones) for an extra 30-40% off on Shop Disney. Mr. Big and the Artist series are 30% off. The rest are an extra 40% off. The only sketchbook ornaments that were available when I checked out were Mr. Big from Zootopia and the Marvel LE film strip. Oh wait, the Jack-Jack with Edna Mode head was also showing up but I wasn't interested in that one. Everything else was sold out. I had Cogsworth and Chip from Beauty & the Beast in my cart, but they disappeared at check out. I was, however, able to get several of the Mickey through the Years on a great sale, so thanks for that heads-up. I don't think many people want that Jack Jack ornament. It's disturbing. 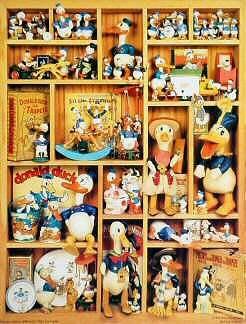 I wish Disney would do an open book style monthly ornament series. The 12 most popular Disney classics would be great. Peter Pan, Pinocchio, Dumbo, Cinderella, Snow White, Sleeping Beauty, Bambi, Sword in the Stone, Robin Hood, and a few more. Yes . . . the open book style Jim Shore pieces are sought after and many collect ALL of them. I only have the UnMerry Birthday and the WTP one . . . those two have much more detailing and character(s) than others. So I'm sure they'd be a hit with Sketchbook ornament styling.